Lee is the founder of Lee Calhoon & Co., a retained executive search firm he started in 1970. Having specialized in healthcare for over 45 years, the firm is very proud to have earned the recognition of being one of the leading healthcare search firms in the United States. The firm’s track record of success is supported by the fact that over 3,000 searches have been conducted across the sectors of payer, provider, information systems and technology, pharmaceutical, disease management, medical device, behavioral health, workers’ comp and disability management, TPAs and PPOs, managed care and Internet healthcare. Lee has conducted workshops, written articles in trade and national publications, and has been a frequent speaker at national and regional conferences and symposia, lecturing on executive recruiting practices and trends, and the strategic role between search firms and startup and early stage companies in the healthcare space. He is the firm’s delegate to numerous healthcare associations, and has traveled internationally with the Presidents of the leading HMOs, and allied health companies studying the healthcare systems of different foreign countries. Recognizing the value of human capital in relationships, Lee was one of the first recruiters to see how you could leverage these underutilized networks into the creation of new businesses. He expanded this concept beyond his personal equity interests in start-up companies, by putting this principle to work in 1997 by co-founding The Nantucket Group, LLC, an early stage healthcare venture capital fund. Several of the funds portfolio company investments were I-trax, Beansprout Networks and EduNeering. As a founder and general partner, Lee is responsible for staffing the portfolio companies, and assists with strategic alliances and partnerships for the funds portfolio partners. A long time resident of Pennsylvania, he resides with his wife in Birchrunville and on Nantucket Island. MA. Lee majored in Textile Marketing & Management at The Philadelphia College of Textiles & Science and has held board positions with organizations and companies in the for-profit and not-for-profit sectors. After 13 years with the company conducting the full-lifecycle of technical, operational, financial, administrative, and clinical search assignments, Chris has maintained the role of Principal within the firm. Managing daily operations to candidate offer negotiations, new client development, and partnership opportunities, his unique insight into technology and excellent communication skills will prove to be a main factor in the continuing success of the company. Prior to joining Lee Calhoon & Co in 2003, Chris spent over a decade in technology and information systems, specifically focusing on wide-area enterprise networking, architecture, and security design, integration, and management. He is a former Senior Network Engineer, National Products Group for Medical Manager Health Systems/WEBMD and also held senior technology positions with SchoolOne.Com, VerticalNet, and Aerotek Corporate/Tek Systems. Chris is a graduate of The Hill School, Pottstown, PA and majored in Philosophy and English at Washington College in Chestertown, MD. He has also held certifications as a Microsoft Certified Professional (MCP), Microsoft Certified Systems Engineer (MCSE) and a Microsoft Certified Trainer (MCT). His unique direct experience with technology has contributed greatly to his continued successes in technical and technology executive recruiting. 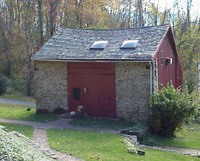 This Pennsylvania “bank barn” is the corporate headquarters of our company. Originally built in 1792, the barn was renovated into an office building in 1978. Farmers used the barn for almost 200 years to store their most valuable assets – their grain, equipment, and livestock. Keeping with this theme, we chose the barn as our corporate logo because it continues to house our most valuable assets – the extensive information in our resume databases, our information technology systems, and most importantly – the intellectual capital shared among our consultants. All pages, graphics, and information herein is the sole property of Lee Calhoon & Co. This website may not be reproduced in whole or in part nor the information it contains used by any unauthorized party without expressed permission of Lee Calhoon & Co under penalty of law. Unauthorized use, abuse, re-engineering, and copyright infringements strictly prohibited. © Lee Calhoon & Co.